So, last month, on the 26th, a friend (one of my sister's best friends which in turn makes her one of my friends.. you get how it works!) had her birthday party. 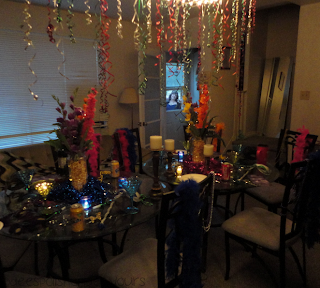 It was a super great 'Murder Mystery Supper' and the theme was Mardi Gras! My character was Bourbon DuPre, he was a struggling and incredibly bitter/angry musician. Needless to say, it was amazing! 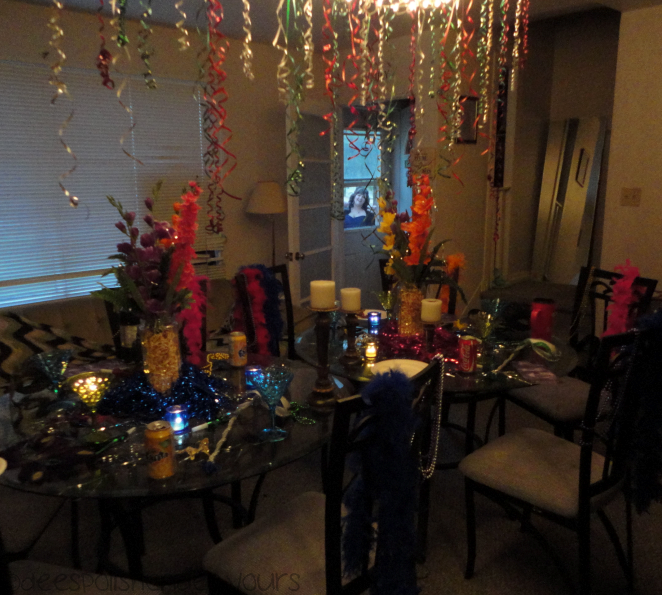 Her and her family really decorated it up amazingly! It was perfect! Now I really want to do this for my birthday.. Come on April! Anyways.. 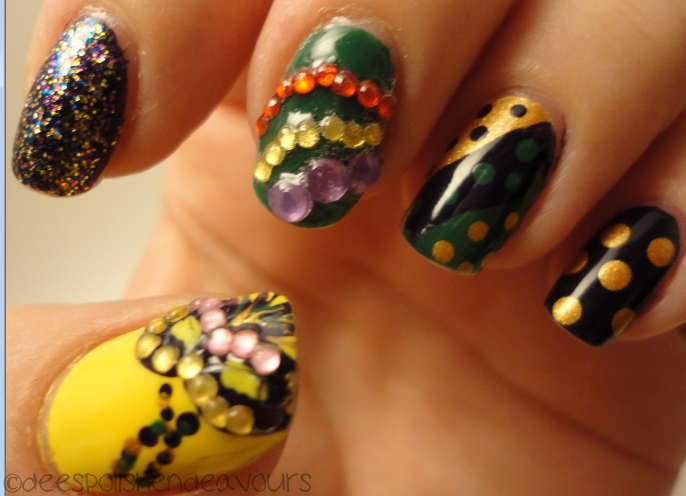 Despite playing a male character, I had to do my nails.. And it was Mardi Gras.. I immediately remembered Emerald Sparkled Mardi Gras manicure. Though mine doesn't even come close to what she did.. The idea of it was there and it looked alright! It was such a great time! I am quite happy to finally be posting this as I am now re-living all of the greatness that was her birthday! Well, I better run off.. Finish building my desk, maybe do some homework/reading for classes, PAINT MY NAILS and get ready for the concert tonight! Eeeee! Have a stellar night everyone!! im glad yo got the package! I had so much mailing problems..then I had to cut it open rearrange it...and then tape it back but the post office didn't have tape so they gave me a giant sticky label.